Today is a big day for Dutch metallers Epica because they just revealed the details of the new album they have been working on. 2014's The Quantum Enigma will be followed by The Holographic Principle. The band's 7th studio album will be released on September 30th, 2016 via Nuclear Blast Records. It was produced by Joost van den Broek, mixed by Jacob Hansen, and features artwork by Stefan Heilemann, available below. More will be revealed in due time. 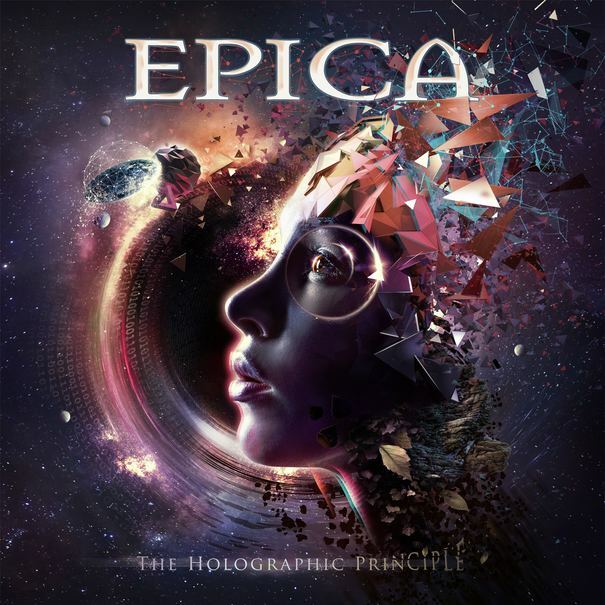 According to Epica, "The Holographic Principle is a true treasure we worked very hard on over the past year. This album contains more Epica than ever before. We are all very happy with the results and can't wait for you to hear it! Come join us on our new musical journey from September 30th on." To celebrate the release of the album, they will be playing at their own Epic Metal Fest (NL) at 013 in Tilburg, The Netherlands on Saturday, October 1st, and also at the 1st edition of Epic Metal Fest (Brazil) at Audio in São Paulo, Brazil on Saturday, October 15th. Hello, most anticipated symphonic album of the year. Yes please! Love me some Simone <3 That artwork is shweet! Pah. By recent standards, they're the only symphonic band we can still call great. I second that. Unlike most people I think I actually prefer Requiem For The Indifferent a bit over The Quantum Enigma - the latter has much better production sure (and arguably better vocal performance/melodies), but I enjoy the more progressive songwriting that really distinguishes this band as among those sitting on the throne of the genre. Epica have always had great music and mostly good lyrics, but I don't agree with some of Mark Jansen's philosophical views (which, again, heavily influenced the artwork and title); in fact, I don't buy into his new-age-esque understanding of quantum physics at all and find his derivative insights to be naive, idealistic/romantic, and lacking in genuinely scientific objectivity. After all, he studied psychology (just like me) and not mathematics or physics, but he seems to draw conclusions from "pop science" writers selling "the quantum woo". That was my long-winded guess at the meaning behind the artwork/title. Great point. Requiem has an amazing songwriting, but the production ruined it. But differently than you, I still prefer Quantum Enigma, which, IMO, was a reboot for the band. I believe they know that Requiem was smashed not only because of production, but because many fans wanted the old Epica with less progressive sound, so they will do that. And maybe it's for the best, because they do it really well. I mean DYU and TQE are the strongest symphonic metal albums in 10 years in the scene. I don't think it is about them sounding less progressive (I'm all in for prog stuff), but that album sounded tired and boring like hell. I remember seeing the band promoting it, with mostly songs from it and I couldn't help but fall asleep. I do agree though that this band is one of the very few who still provides some quality in a genre so saturated like symphonic metal. Why can't they do a crowd funding like Edenbridge? Then I can go on a tour of The Netherlands with Simone. Hey man, you're a married man. Lay off. I know, but she is on "The List", along with Abby off NCIS. Looks good. I like the previous 2 albums so I'm optimistic about this as well. I fully expect the new one to have horrible lyrics tho. True. That would top my expectations for Epica. WHY ARE THEY TAKING FOREVER!?! Don't they know we need their music?